The Cuban province of Granma is planning to plant 604 hectares of coffee in 2010, which represents the largest planting of this crop in the last 15 years. To meet the program the territory has more than 2 million seedlings at 108 nurseries, ensuring the planting as part of the coffee processing. Engineer Alcides Aguilar Carranza, a specialist in the Ministry of Agriculture in Granma, noted the work of growers in the six rural municipalities. He reported that at the end of November 2009 the province met with the planting of 402.1 ha, especially the municipalities of Buey Arriba, Guise and Campechuela, as well as the planting of 68.5 hectares of cocoa, resulting Guisa and the Buey Arriba the best records in the territory with the 181 and 173 percent of productivity, respectively. 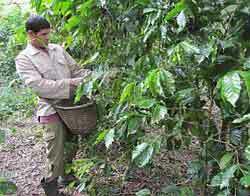 Granma is the third producer of coffee in Cuba, after Santiago de Cuba and Guantanamo.